This review might sound a little cheesy, but if you're looking for a place to stay in Kyoto; then look no further. Regarding cleanliness, it was spotless when we arrived. It's really well kept! It's also well-equipped with plenty of ACs, which truly saved us from the summer heat outside. Location wise it's pretty close to the Central station. There's also a buss station really closeby, like less than 100 meters. There's also plenty of nearby places to do grocery shopping. Finally, we had the honor of talking to Akiko and Patrick. From my traveling I've rarely had such an easy time to book and communicate with a host/hosts. Akiko and Patrick answers quickly on any questions you have and and they are extremely helpful, professional and considerate. For someone who can't read Japanese there's plenty of documentation in English, for example: how the washing machine works, TV, how to get to common places and nearby sightings. Our visit in Kyoto was truly 5/5 stars. If we visit Kyoto again we'll gladly stay at the Machiya again. I had a wonderful time staying here for a work conference in July 2018. Akiko was extremely responsive and very helpful. My stay went very smoothly and was incredibly stress-free! Everything you need to know was provided beforehand (to have a smooth arrival) and in the documents at the machiya (to have a great visit). The machiya is gorgeous and the perfect size! Highly recommended. Every detail was perfect. We truly felt at home in this beautiful machiya, and we particularly enjoyed the neighborhood away from throngs of tourists but convenient to Kyoto Station. A lovely visit. Oh! And the Toji Market on the 21st was the highlight of our stay. Great place to stay. The loft was a bit small. The shower and bath was really nice and roomy. There wasn’t any dish washer soap so we had to hand wash the dishes. Fantastic host and beautiful property. Comfortable beds. Would 100 percent recommend to anybody. Fantastic host and beautiful property. Comfortable beds. Would 100 percent recommend to anybody. Thank you for letting us stay at your place. Wow! My husband and I have rented homes in countries around the world, but this one is really something special. 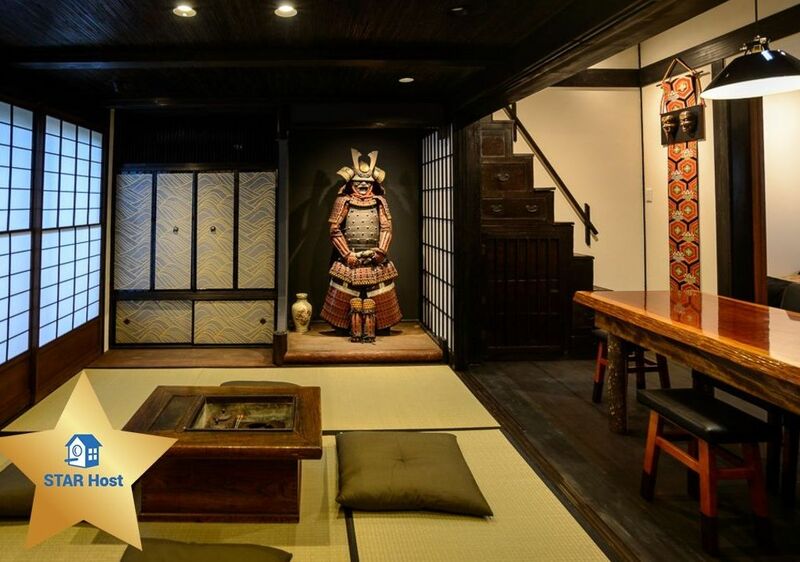 It is the *perfect* combination of stunningly beautiful traditional Japanese aesthetics with just enough Western amenities for travelers like us. It’s spacious, clean, and has so many little thoughtful things (like heated floors!). It’s just a few minutes away from the train, so getting around was very convenient, but it was still in a nice quiet area. And, of course, the samurai armor is super cool. The hosts were very nice and the whole process was a breeze. We would stay here again in a heartbeat!